FC Locksmith has been providing exceptional keyless entry lock service in Toronto for a very long time. Our lock specialists excel at installing and repairing keyless locks for both the residential and commercial community. Key less door locks are growing in popularity across the Toronto, ON area. These devices are designed to work with a code, not a key. This eliminates the need to carry a key and the risk of replacing it every time it gets lost. 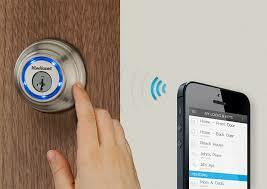 Of course it is important that the user remembers the code in order to gain entry into the home or business. We are the key less entry system experts and we can install keyless door locks quickly and accurately; often in the same day the service is requested. These types of locks reduce the possibility of an intruder trying to use a key to the home or business. Trying to figure out the secret code could be virtually impossible. This device and a high security dead bolt will keep the location safer and more secure. Not only does FC Locksmith provide impeccable keyless locks installation, but we also provide superb key less locks repair. Our specialists provide Toronto keyless entry lock service with precision and care. Our concern for the welfare of our residential and commercial customers is vast and well documented. We install these locks effectively to provide our customer with the peace of mind they deserve. In addition to installation, we also provide amazing repair service for this type of locks. Our experts respond urgently to provide repairs on these types of lock devices. We have the experience, training, and special skills to successfully address all keyless lock needs. Contact FC Locksmith today for highly respected and trusted lock service experience.